Bring peanut-free food to all potluck sharing, please! Subject to changes; check this page regularly for the latest information. Saturday, Jan 12 10 AM – 4 PM Haiku Workshop by Patricia Machmiller at Markham House, History Park, 1650 Senter Road, San Jose, CA. This workshop will give participants the opportunity to develop their internal critic. Bring haiku struggling to lift off and a bag lunch. Directions to the History Park. Tuesday, Jan 15 YTHS membership Dues for 2019 due. Membership form and more details can be found here. Friday, Feb 1 Submissions deadline (YTHS members only) for first 2019 GEPPO. Saturday, Feb 9 1 PM – 4:30 PM Haiku Workshop by Phillip Kennedy at the home of Dyana Basist, Santa Cruz, CA. This workshop will look at the history of season words and seasonal topics in Japanese poetry. Phillip will also share some season word descriptions from an Edo Period saijiki. Please carpool. Saturday Mar 9 1 PM – 4:30 PM Haibun Workshop by Carolyn Fitz, Cliffwood Estates Mobile Home Park Clubhouse, 3200 Cliffwood Drive, Soquel, CA. Bring a short personal story (1-2 paragraphs) to read aloud and to inspire a haiku. RSVP to Carolyn at: inkstonefitz@comcast.net. Snack table contributions welcome / please no peanut content. Saturday Apr 13 11 AM – 3 PM Garden Tour, Picnic, and Ginko at the Tilden Botanic Garden, Berkeley, CA, led by David Sherertz, Garden Docent and YTHS member. Gather at the Visitor Center. (to the left of the Main Gate, at the intersection of Wildcat Canyon and South Park Drive.) Easiest parking is in the parking lot across from the Garden on Wildcat Canyon Drive. Directions to the Garden. David Sherertz will be our docent for a garden ginko with writing and sharing time. Lawn picnic potluck lunch first, bring blanket or low chair. Please bring peanut-free food to all potluck sharing. Flyer for this event. Wednesday, May 1 Submissions deadline (YTHS members only) for second 2019 GEPPO. 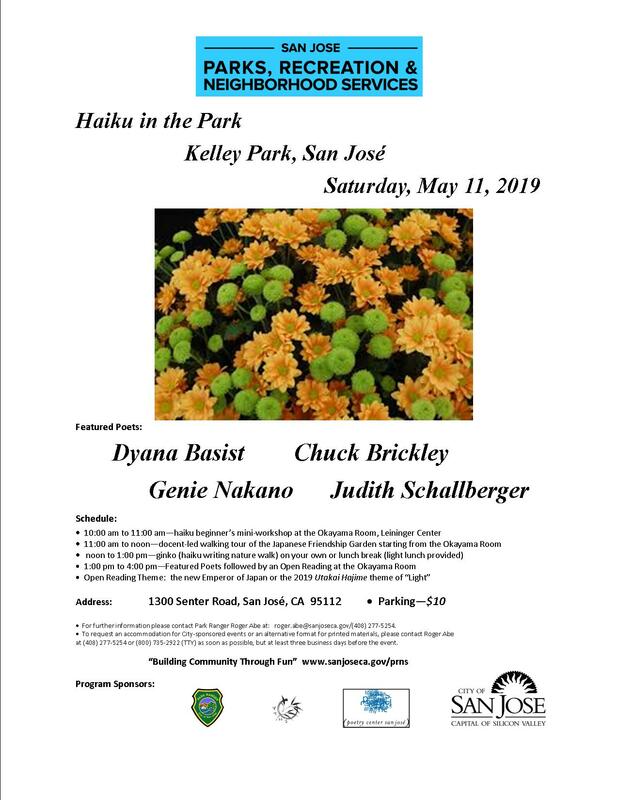 Saturday May 11 10 AM – 4 PM Haiku in the Park, Okayama Room/Leininger Center, 1300 Senter Road, San Jose, CA. Flyer for this event. Saturday Jun 8 – Sunday Jun 9 Day or overnight trip to the historic first Japanese colony in the USA. The Wakamatsu Festival 150-Year Celebration, Coloma, CA. Details to follow. Saturday Jun 15 10 AM – 2 PM Sharing of the Wakamatsu Festival at Alison Woolpert’s home, Santa Cruz, CA. Potluck lunch and Haiku writing. Please bring peanut-free food to all potluck sharing. For further directions, please consult GEPPO. Saturday Jul 13 6 PM – 9 PM Yanabata Celebration and Potluck at Anne Homan’s home, Livermore, CA. Please bring peanut-free food to all potluck sharing. Thursday, Aug 1 Submissions deadline (YTHS members only) for third 2019 GEPPO. Annual Board Planning Meeting and Potluck at Mimi Ahern’s home, San Jose, CA. Please bring peanut-free food to all potluck sharing. Saturday, Sep 14 5 PM – 9 PM Moon Viewing and Potluck at Linda Papanicolaou’s home, Stanford, CA. RSVP to paplinda@yahoo.com. Please bring peanut-free food to all potluck sharing. Saturday, Oct 12 12 Noon – 4 PM Picnic Lunch at Hakone Gardens, Saratoga, CA, Picnic, Ginko, Haiku writing, and sharing. Bring your own lunch. Directions to the Garden. Friday, Nov 1 Submissions deadline (YTHS members only) for fourth 2019 GEPPO. Friday Nov 8 through Monday Nov 11 YTHS Haiku Retreat at Asilomar Conference Center, Pacific Grove, CA.. Newcomers welcome. Set in a beautiful natural landscape with opportunities to learn from other experienced poets and artists. Friday lunch through Monday lunch. Saturday Dec 14 5 PM – 9 PM YTHS Holiday Party at Patricia and Al Machmiller’s home, San Jose, CA. Pot-luck dinner and card exchange. Please bring peanut-free food to all potluck sharing.